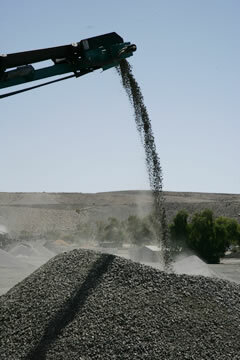 Activities include contract crushing/screening, bulk haulage, and open cut mining. Consolidated are committed to delivering Professional Quality Assured Service and have the advantage of a proven track record and an unequalled experience within the region. Major repairs to flood damage rail embankment for Australian National - between Olary and Yunta, SA. Access road and car park at Line of Lode, Broken Hill NSW. Construction of 2km roadway in Mildura for standard roads on Ontario Ave.
Construct earth pads at Elura Mine, Cobar to receive containerised hazardous waste product. 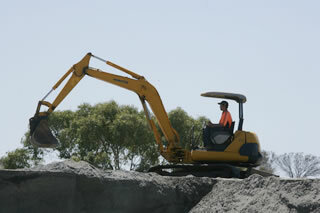 Carried out Civil Works for the new Broken Hill hospital. New water filtration plant, Sunset Strip, Menindee for Australian Inland Energy and Water. Carried out Civil Works at the Bemax Ginkgo Mine site. Design and construct 64km new haul road for Bemax. Design and construct dual lane bridge for Bemax. Survey and construct 1.7km airstrip a Ginkgo. Our highly skilled team offer a wealth of experience in the design, excavate, fill and completion of all your civil requirements to a standard of excellence. 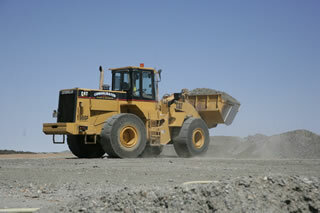 Transportation of 1 million tonne per annum of ore from the Zinc Mine to the NBHC shaft - Broken Hill. Load and haul 850,000 tonne of mill tailings from Zinc Mine to North Broken Hill. Load and haul 1,300,000 tonne of ore from Southern Cross Shaft to NBHC Mill for Pasminco Mining, Broken Hill. Do you require bulk haulage, heavy haulage, or general haulage? Consolidated have the haulage solution for you! We have 20 Prime Movers along with 20 Road Train Side and End Tippers. For your heavy haulage requirements 2x 50 tonne Quad Axles Floats and 2x 25 tonne Floats. Flat top trailers, extendables and tank trailers. Consolidated can haul almost anything and are renowned for their timely and professional transportation services for all kinds of equipment and goods.